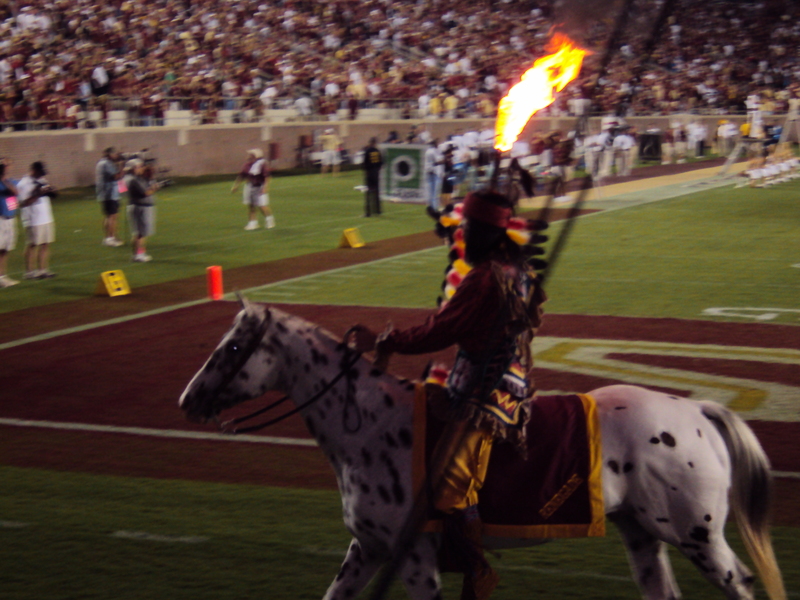 With the first Florida State game quickly approaching (4 DAYS!! ), I’ve been scrambling to get stuff together for our at home tailgate. The one thing that has been prepared for quite some time is my game day outfit. I purchased this Judith March Tomahawk Tank back in July from one of my favorite boutiques in Tallahassee, Cole Couture. It’s a feminine take on the classic frat tank and the tomahawk graphic print represents FSU perfectly. 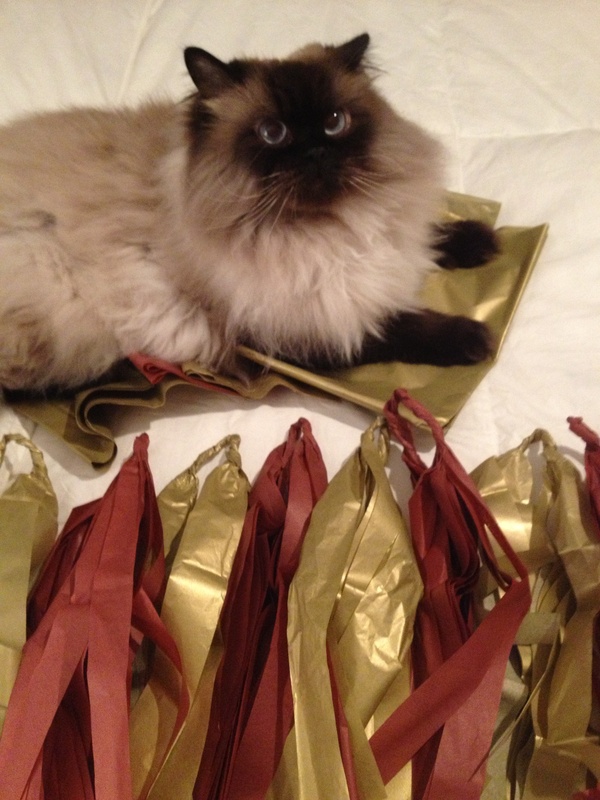 I’m pairing it with a gold skirt to add a little glam to my garnet and gold look. To top off my game day style, I added some dainty gold jewelry, like this arrow necklace, and my favorite ankle booties . 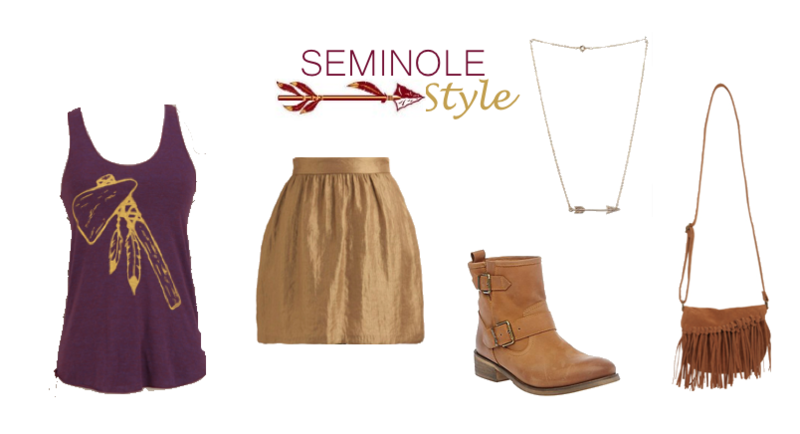 Showing your school spirit doesn’t have to look cheesy and this look has me feeling super chic and ready to cheer on my Noles! With a new season comes a new look and this Fall, I’m wanting to change up my hairstyle. Over the years, I’ve dabbled with highlights here and there, gotten bangs, and chopped it all off, but mainly, I’ve kept the same hairstyle-long and brunette. I have a hair appointment this Saturday and I’ve been looking to Pinterest for inspiration for a new look. I don’t think I’m bold enough to stray too much from my natural, dark brown hair, but I am loving the ombre trend right now. Not to mention- it’s very low maintenance. 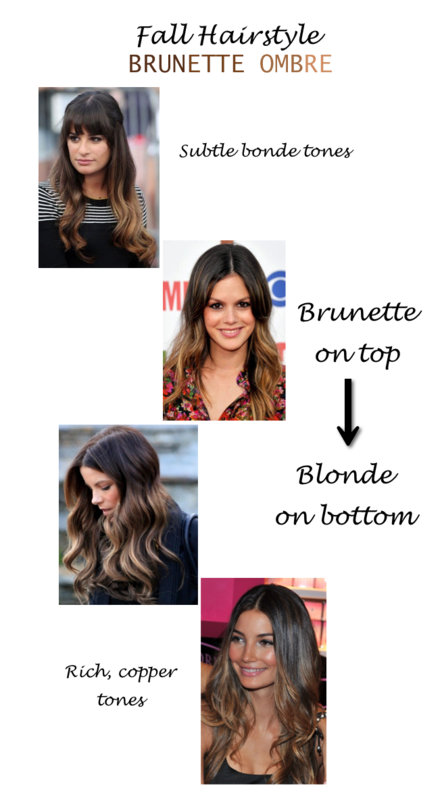 It’s the perfect blend between brunette and blond, without going overboard. I’ve gathered some of my favorite brunette ombre looks. My personal favorite is Lily Aldridge’s mixture of dark brown roots with copper tips. I don’t think blonde would look right with my complexion, so I am hoping to add some warmer, brown tones to my tresses. Here’s to hoping I’m brave enough to take the plunge this Saturday and add some much needed color to my hair. What’s your favorite Fall hairstyle? The grocery stores are putting out the last of Summer fruits and I’ve been trying to take advantage as much as possible. 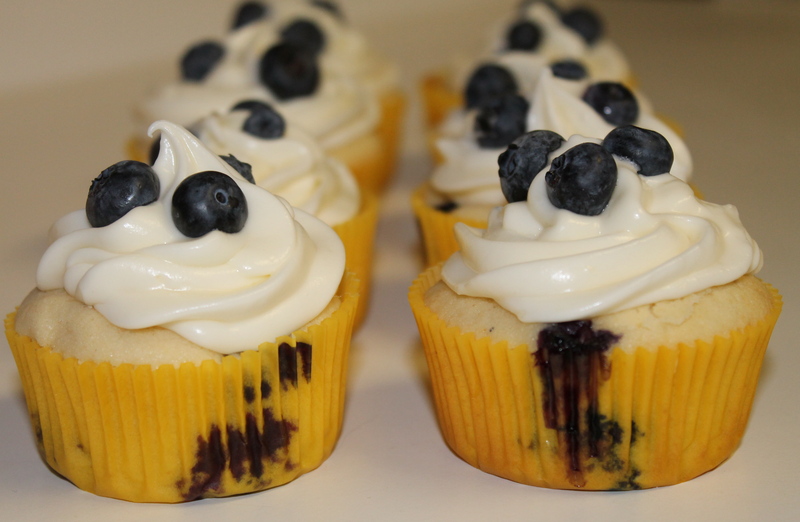 I’ve mainly been adding fresh fruit to my morning smoothies, but when I was asked to make cupcakes for a small get together, I wanted to incorporate fruit somehow. I headed to the grocery store without a recipe in mind, only to be greeted by the best looking blueberries. They were bright blue, plump and looked so sweet. 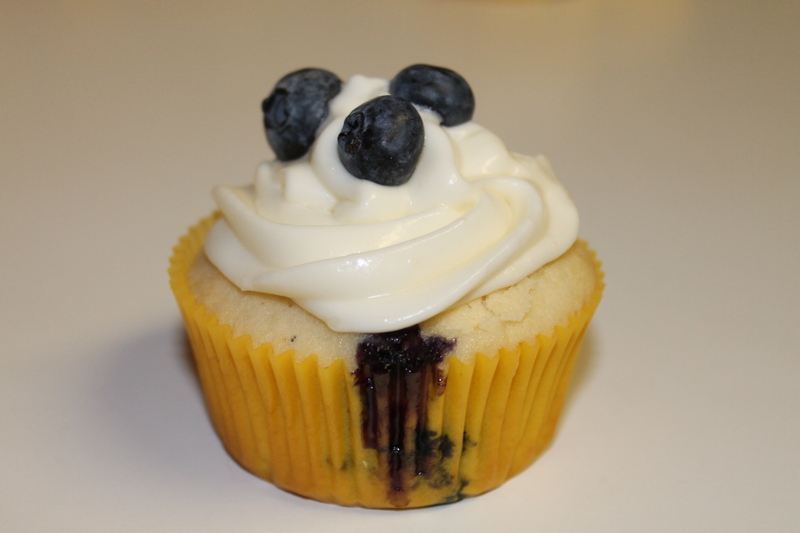 In that moment, I got the idea for Lemon Blueberry cupcakes and they honestly might be my new favorite! Yes, I’m cheating on my beloved Cookies and Cream. 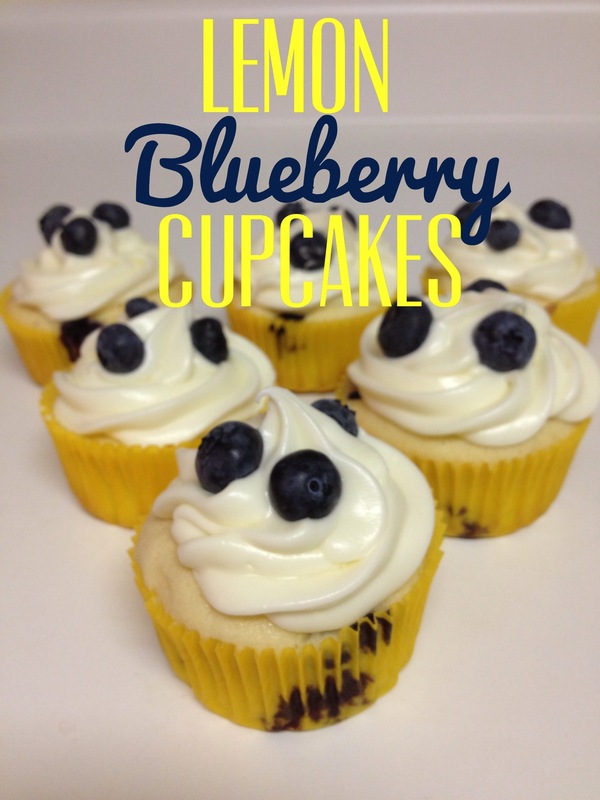 Light and airy lemon cake combined with fresh, juicy blueberries and topped with my zesty lemon cream cheese frosting made for the perfect summertime dessert. 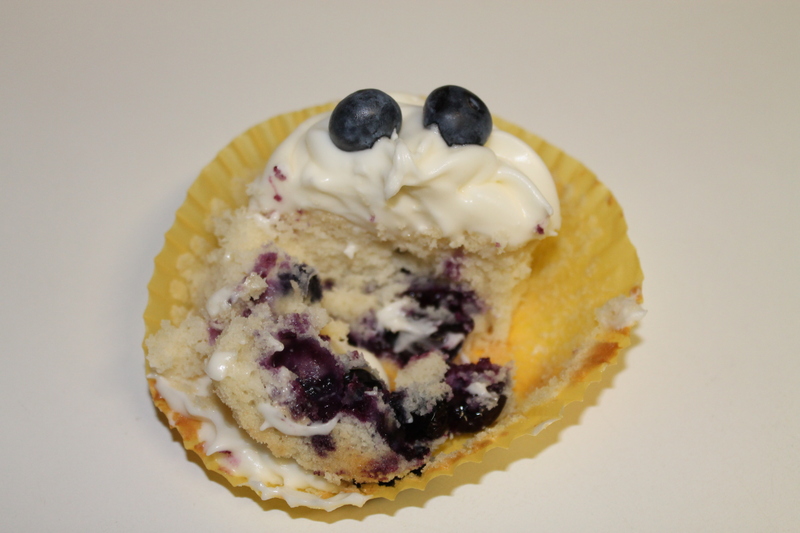 I love how the warm blueberry oozes out when you take a bite. Easy to make and a hit at dinner, my only suggestion for next time would be to make more! 2. In a medium bowl, whisk together 3/4 cups of all- purpose flour, cake flour, baking powder, baking soda and salt; set aside. 3. In the bowl of a stand mixer fitted with the whisk attachment, cream together butter and sugar on medium-high speed until light and fluffy, about 3 minutes. 4. Add eggs one at a time, beating thoroughly after each addition. Mix in vanilla extract, lemon zest, and lemon juice. 5. Reduce the mixer to low speed and add the flour mixture in 3 batches, alternating with the milk, starting and ending with flour. Mix until just incorporated. 6. 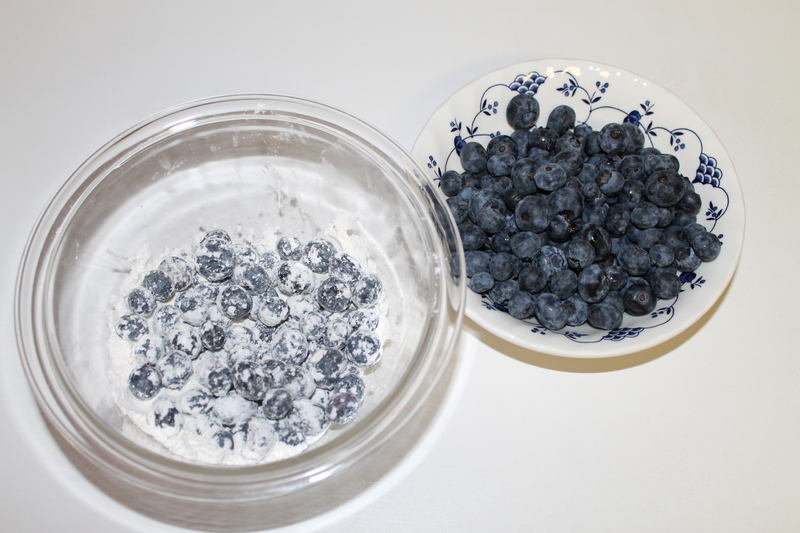 In a small bowl, toss the blueberries with the remaining 2 tablespoons of flour. 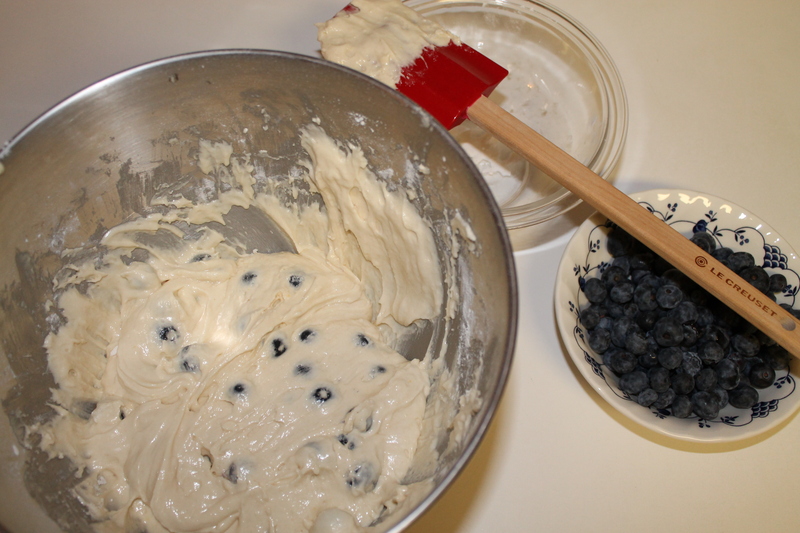 Using a spatula gently fold the berries into the cake batter. 7. Divide the batter evenly among muffin pan cups. 8. Bake 21-23 minutes or until toothpick inserted into center of cupcakes comes out clean. Let cool in the muffin pan 5 minutes, then transfer to a wire rack to cool completely. Once cooled, top with lemon cream cheese frosting. Summer is fading and Atlanta is already starting to feel the effects of Fall. Nights and mornings are getting cooler, and in my opinion, this in-between season is the perfect time to go on a camping trip. It’s not too hot, not too cold and still perfectly acceptable to roast s’mores around a campfire. I mentioned to my boyfriend the other day that we should plan a camping trip before the weather gets really cold. His ears quickly perked up, and he responded, “Yes! 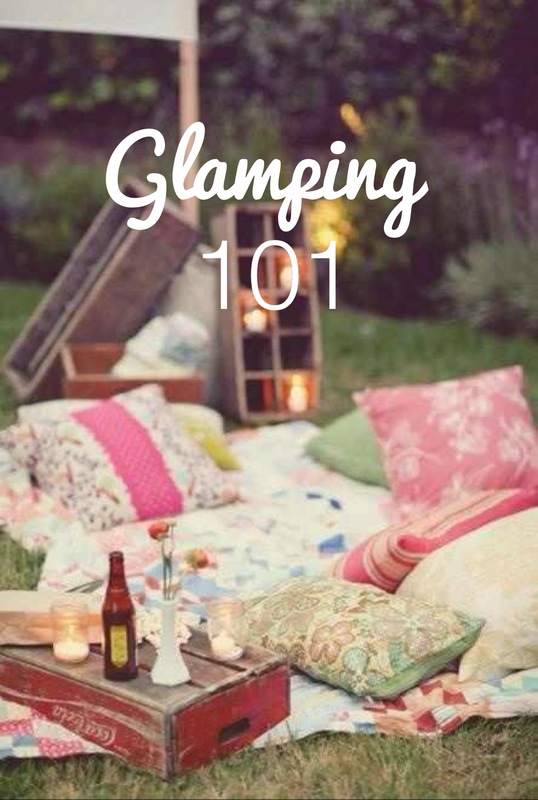 I really want to go on a rugged camping trip like Naked and Afraid, living off the land with very little resources, using only our survival skills.” That wasn’t exactly my vision for the camping trip, so I had to rephrase my statement, “Let’s go glamping!” Glamping, also referred to as Glamorous Camping, is a way to experience the splendor of the outdoors without forgoing the creature comforts you can’t live without. I’m all for being outdoorsy, but I prefer to be well prepared, amenities within reach . Here are my favorite glamping essentials, including my personal favorites- this pullover from Camp Brand Goods and this MiniMergency Kit from J.Crew. With the long weekend ahead, it’s the perfect time to plan a glamping trip. Happy Glamping! One of my favorite indulgences is a bi-weekly mani/pedi, but it’s very rare that I paint my toes the same color as my nails. Mixing hues can be fun, however it’s important the colors complement each other. I usually opt for lighter, neutral tones on my nails and brighter, unconventional tones on my toes. I put together my five favorite color combinations that I rotate frequently. 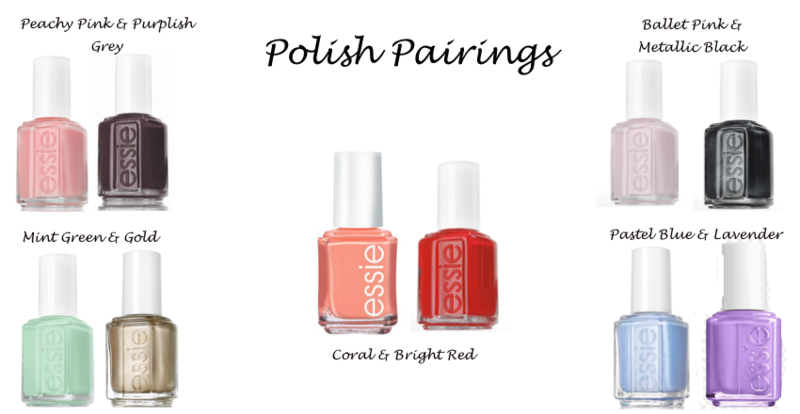 I’m currently loving Essie’s Van D’ Go and Smokin’ Hot for the perfect in-between season look. Van D’ Go is a peachy pink which is still appropriate for warm Summer weather, yet pairs perfectly with Smokin’ Hot-a purplish-greige that is perfect for Fall. 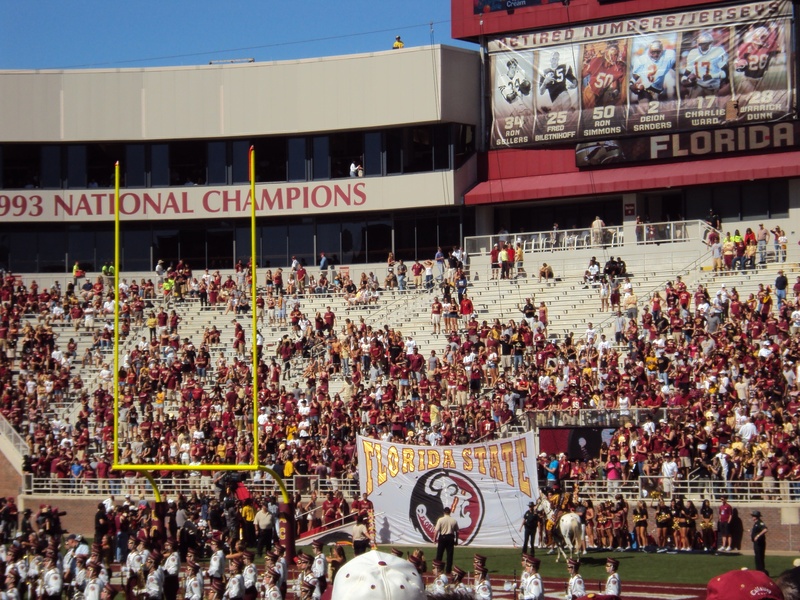 The first Florida State game is in just a few weeks and I couldn’t be more excited! 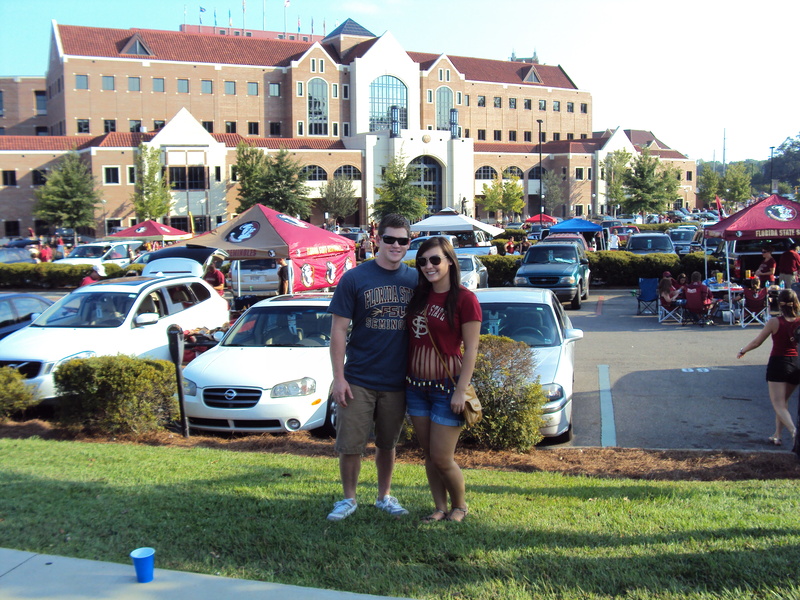 Game days at DOAK are the best! This season is definitely bittersweet since it will the first time in 6 years that I won’t be in Tallahassee to attend every game, but that doesn’t mean I can’t cheer on my Noles from the comfort of my own couch. 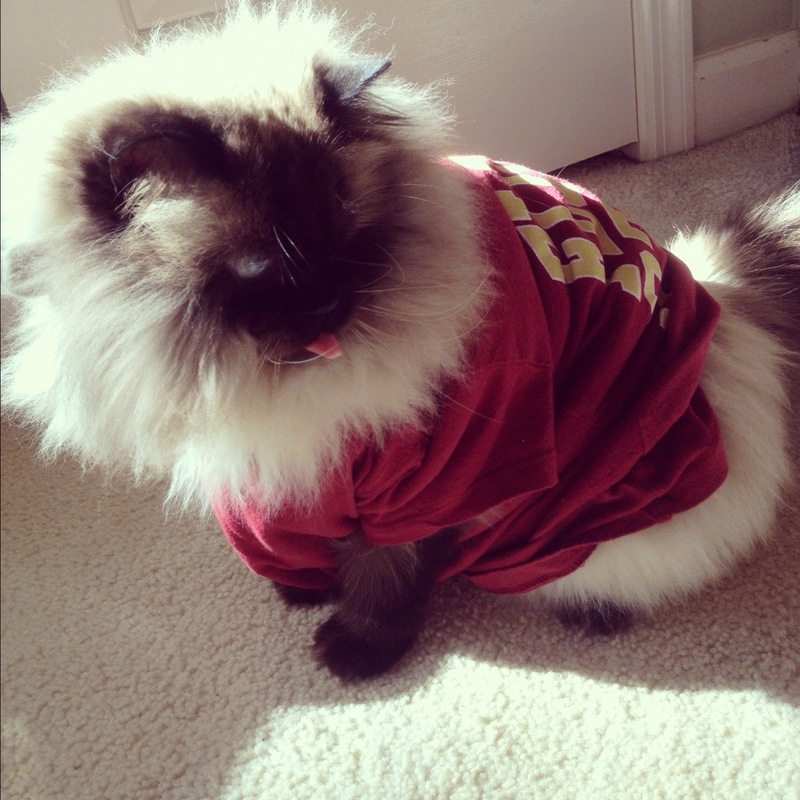 I’ve already started decorating my house so the neighbors are well aware we bleed garnet and gold. 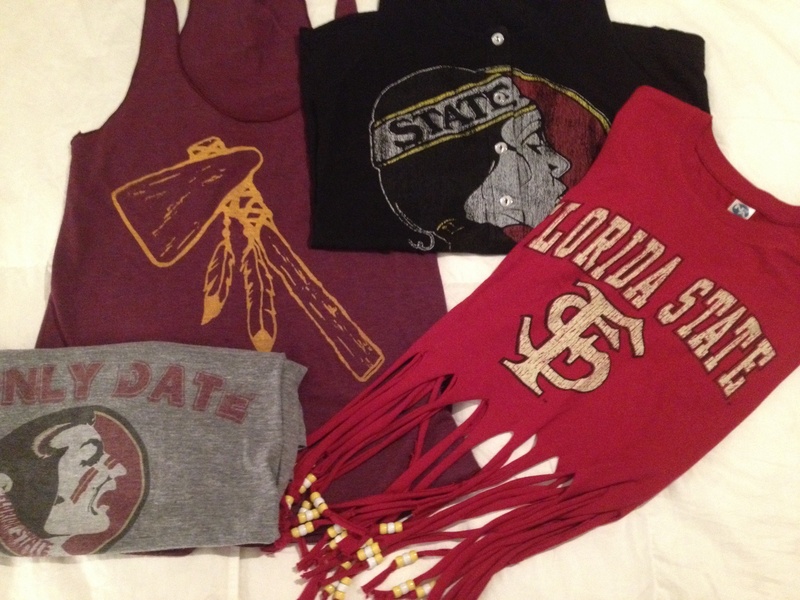 I pulled out my favorite FSU shirts to plan my game day outfits and even gave my chalkboard a festive FSU inspired design. 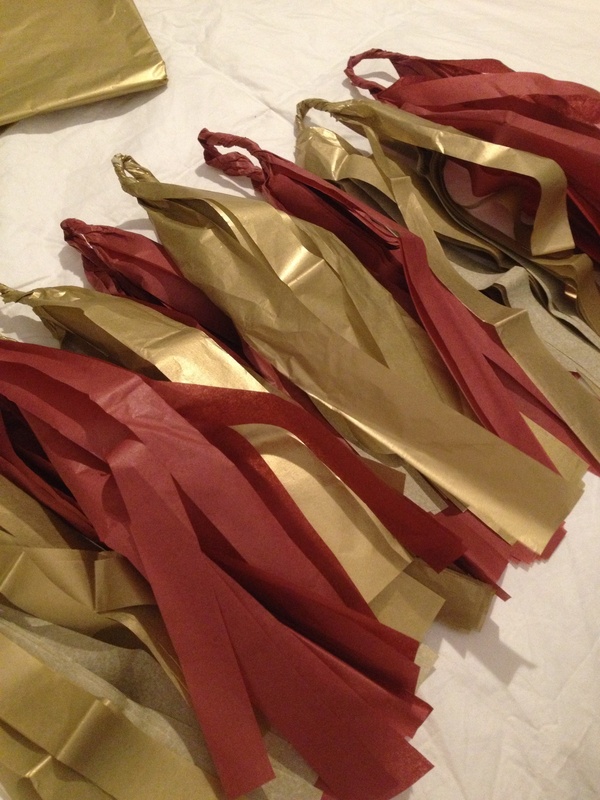 As mentioned in this post, I began working on my garnet and gold tassel garland that I plan to hang across the mantle. George was kind enough to help out too. And, what’s a tailgate without cupcakes? 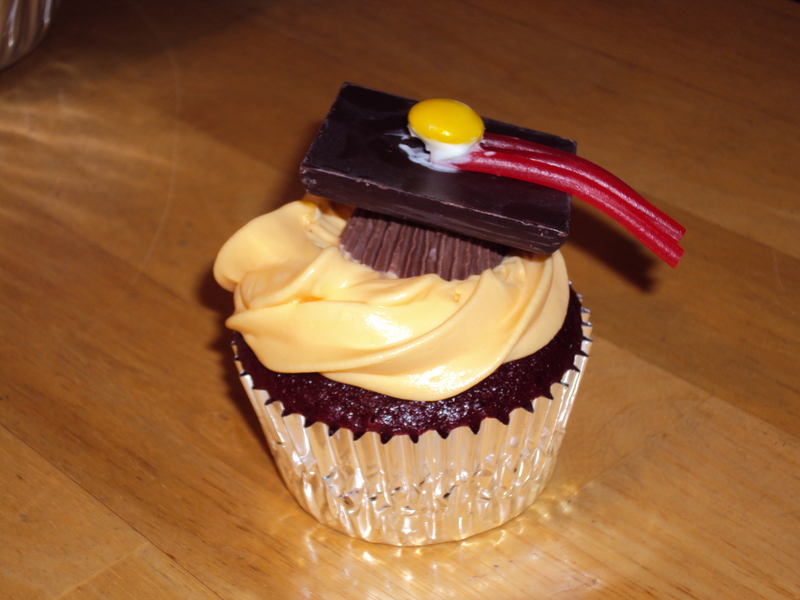 For my boyfriends college graduation, I made him some FSU themed grad cupcakes. 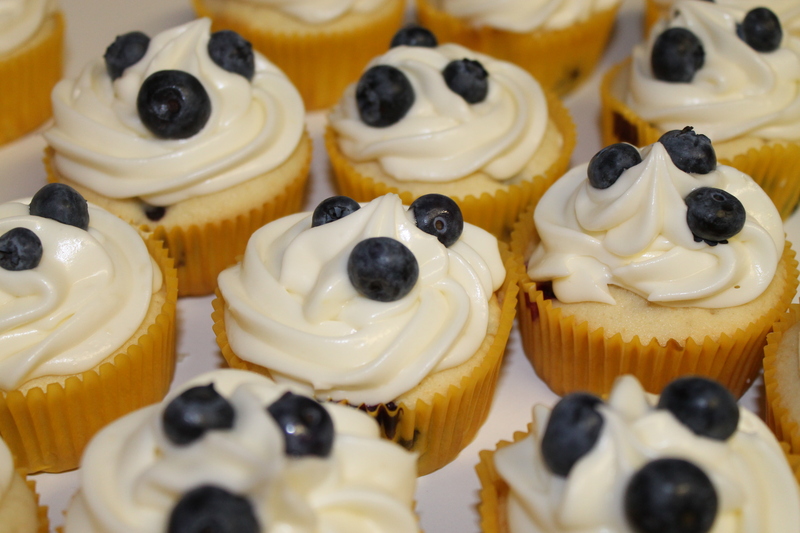 I’m perfecting my red velvet cake recipe so I can make these same cupcakes, but with a football spin for game days. 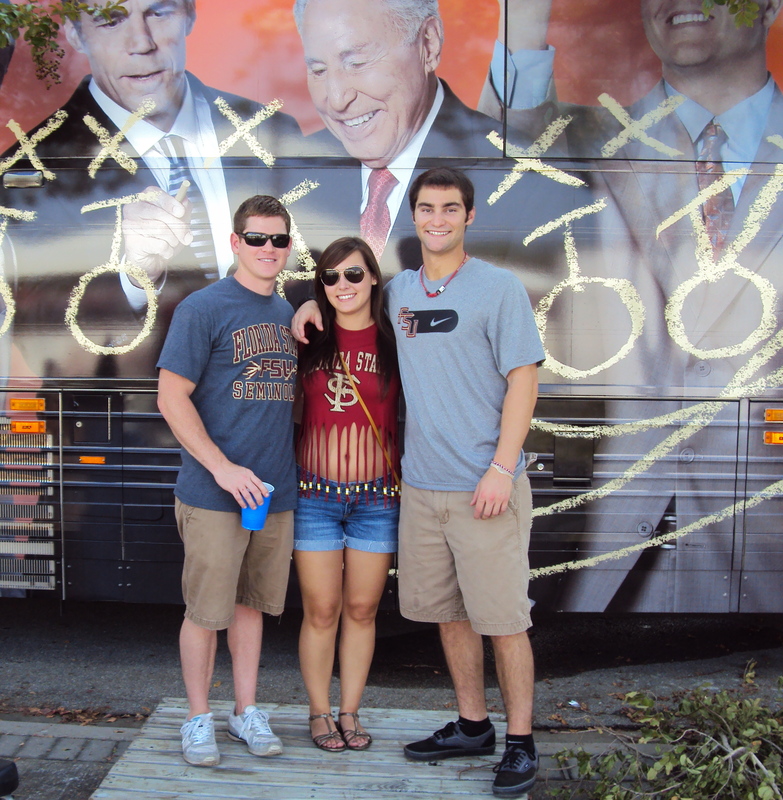 Some of my best college memories involve Florida State tailgates. 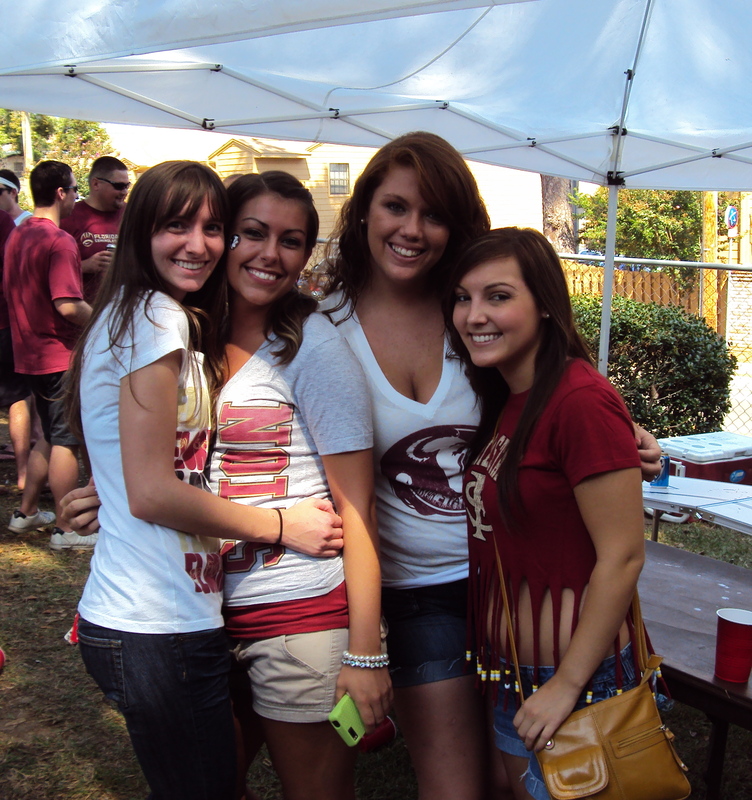 There is nothing better than beer and football on crisp Fall day, surrounded by your closet friends. 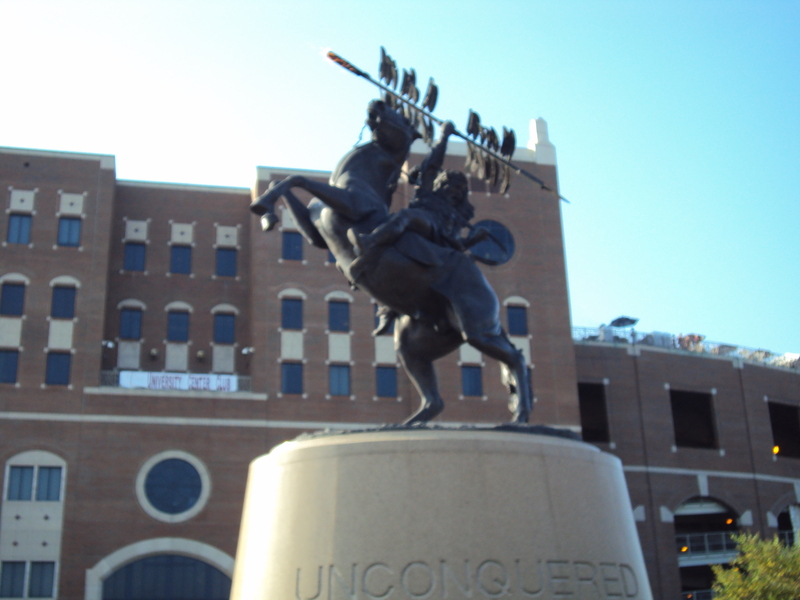 I’m looking forward to Seminole Saturdays, another great football season, and hope I can make it to a game at DOAK this year! 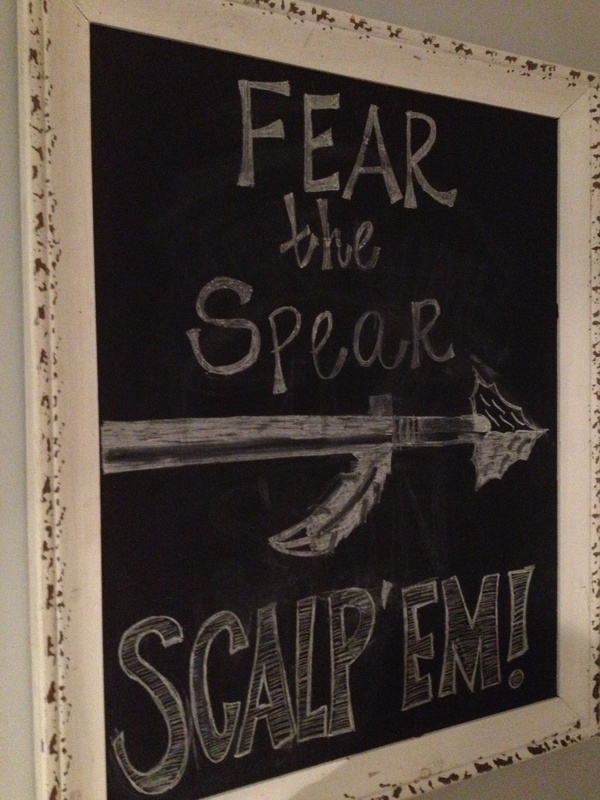 GO NOLES! My leopard flats have always been my go-to shoe, but after three years of wear and tear, I’ve sadly had to say goodbye to them. The suede detailing is faded, the soles are worn out, and with Fall just around the corner, I’ve been on the hunt for a new pair. 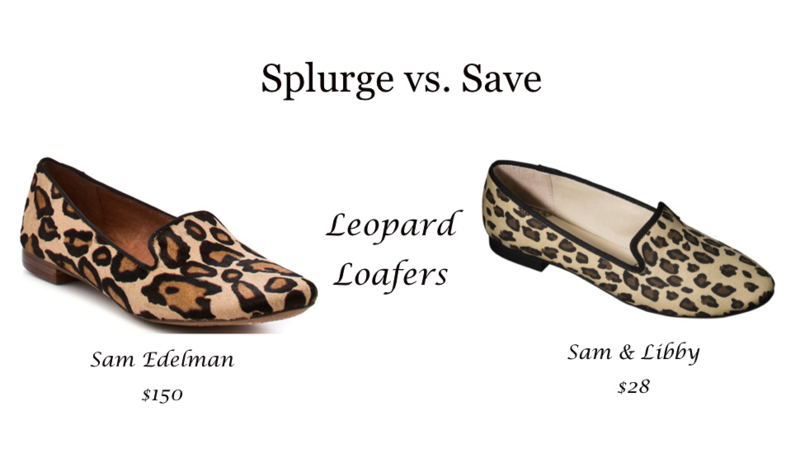 I’d been searching for a while and almost gave up hope until I saw this pair of leopard loafers by Sam Edelman. Loafers are similar to a flat, but are more sophisticated with sleeker lines and a small heel. They can easily be dressed up for a day at the office or down for a casual night out. This particular pair was a bit too expensive for my budget, so I was even more ecstatic when I found these Sam & Libby for Target leopard loafers. The print is almost identical, but at a much lower price point.